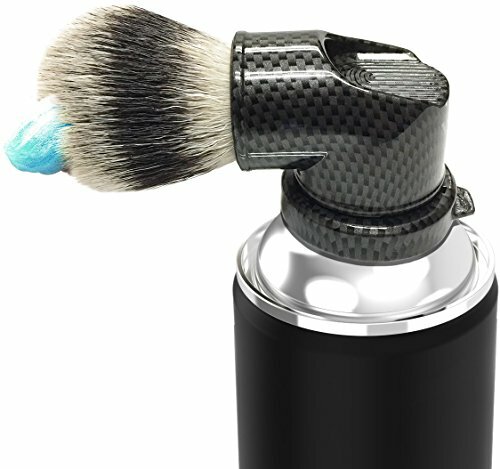 The EVOLUTION SHAVING CAN BRUSH is a shaving brush that universally attaches to all shaving cream and shaving gel cans. With it’s Brush Lathering Technology it offers “The Ultimate Shaving Experience” by stimulating and lifting the hair follicles allowing the users an enhanced shaving experience with the cleanest, closest shave possible. Legacy Shave’s ™ Evolution Shaving Brush is truly the next evolution in shaving. It combines old world technology of the shaving brush with today’s modern shaving cream/gel cans. In the comforts of their homes or while traveling, “The Evolution Brush” enables the users to go straight from the can through the brush to the face or body. Most importantly, it makes shaving fun again. Materials: ABS Plastic and synthetic nylon brush Universal: The Evolution Shaving Brush can be attached to all shaving cream can types. Practical: Helps distribute shaving cream/gel neatly and evenly. Less cream, less mess: You’ll use up less cream or gel, create less mess, and infuse your mornings with a vintage vibe. Application: The shaving brush can be used for face and for body. Care: Keep the shaving brush attached to the can and rinse the brush out with water after use. After rinsing give it a few shakes and set it on counter to air dry. Dimensions: 4″ x 1.75″ diameter. Weight : 0.13 lb. Color : Carbon Fiber.Please note : Shaving can not included. UNIVERSAL SHAVING BRUSH: The Evolution Brush is the world’s 1st wet shave brush that universally attaches to shaving cream & gel cans offering users the convenience of combining their favorite shaving lather and shaving brush into 1 stand-alone unit. ENHANCED SHAVING EXPERIENCE: Applying cream by hand tends to mat hair follicles down leading to undue irritation. The evolution brush will work its bristles underneath hair follicles causing them to stand at attention for smooth razor hair removal. ALL IN ONE CONVENIENCE: Forget all the shaving tools that go along with a traditional shaving brush. Declutter your shaving area by forgetting the hair shaving brush stand. Never clean a beard shaving bowl again. Just rinse, shake, & you’re done. REDUCED MESS & COST SAVINGS: The Evolution Brush’s patented design allows shaving cream & gel to flow directly through and to the bristles keeping your hands free of mess while saving you money by preventing excessive shaving lather waste. FANTASTIC GIFT: The Evolution Brush is a terrific gift for anyone looking to add convenience, reduced mess, save on costs, and enhance their shaving experience. If not for yourself, help make shaving fun again for those special people in your life! Shave against the direction of hair growth. Our razor is shave ready when out of box, if in case you feel it is not sharp enough, only need some passes on a strop, it is really make difference. – Learn the art of shaving with a quality Cutthroat razor. 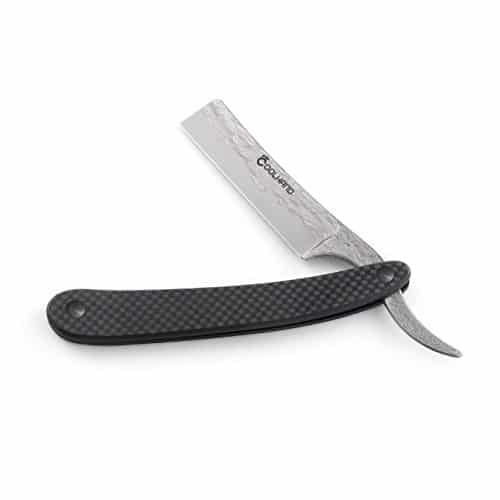 With a 3″ round point carbon steel blade you get plenty of coverage with which to tame that beard. 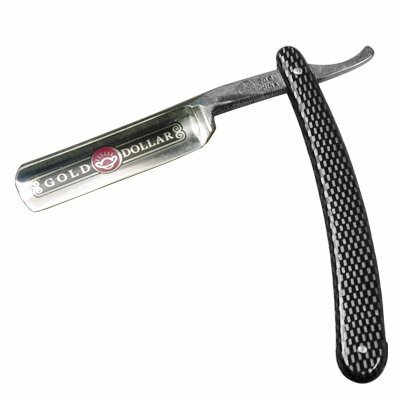 – This is a Classic Men’s Straight Razor with Modern Grade men’s razor is the perfect men’s gift for Dad, Brother, Husband, Son, Groomsmen, or any other hard to shop for Gentleman.It is the perfect gift for a beginner, intermediate, or expert shaver. – Comfort in use, smooth and easily for traditional shaving. – Hollow design is conducive to dry razor after use and inhibit bacterial growth. – Our warranty is simple and straight forward. If you don’t like it for any reason we will offer you a full refund. Professional Barber and Professionally approved Our Black Edition combines all the things you need to shape your facial hair and get the closest Wet shave possible Durable From top down this set is very well constructed and will last many years with proper maintenance. Brush Handle – Not Plastic but made of high quality resin will not chip, crack at all. 10x better than competitive plastic handles on the market Razor – top quality carbon steel – Make sure you properly allow the blade to rest in between shaves… Ideally carbon steel needs about 24 – 48 for the fingers to open back up Dual Black Leather and Canvas Premium Strop… Super soft super durable as good as you are going to get….Make sure before shaving you strop blade with 25 – 50 passes to make your blade perform at optimal performances Ceramic Knob handle Mug/ Bowl Vintage classic Old School all the way…enjoy the process and make your Grandfather happy! Quality GBS manufactures high-end grooming tools and accessories. We proudly offer high-quality craftsmanship and exquisite style at an affordable price. * Deep hollow grinding makes this RAZOR blade super sharp hair pop cutting and silky smooth shaving without irritating skin . * FEATHER WEIGHT HANDLE was made out of carbon fiber. * FOREVER CLASSIC STYLE constructed from two modern elements: Genuine Japanese VG10 damascus steel and CARBON FIBER. * GREAT MAN GIFT FOR Male and female who to give a gift to Man. * GET BEST SHAVE OF YOUR LIFE EVERY DAY Cool Hand razors will keep thousands of men (and their women) happy with awesome clean faces not just by looking but also by touching. We accept refund or return for quality defects within 30 days of purchase. We commit each customer 100% satisfaction, so please contact us before leaving neutral or negative feedback for best solution. This stylish folding razor offers a solid steel 3\” blade with a mirror finish. Added jimps along both sides (top & bottom) of the tang for gripping aid. Straight spine, modern tail design and single shoulder style blade increase the rigidity of the ground part. The black & white rectangle checkered colors in smooth polished ABS plastic scale is contoured to fit perfectly into your palm. Item comes with a complimentary clear, hard cover holder. 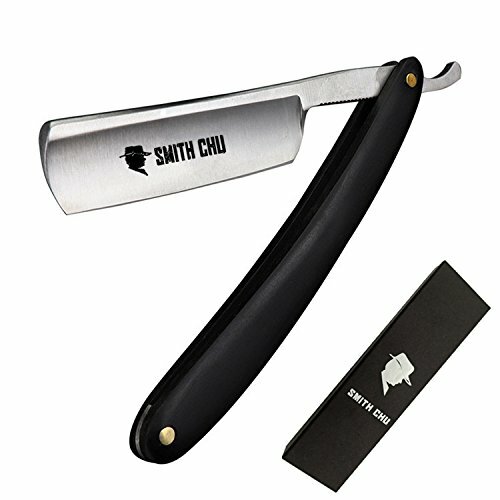 Ideal Straight Razor for home, barber shops, personal or professional use. 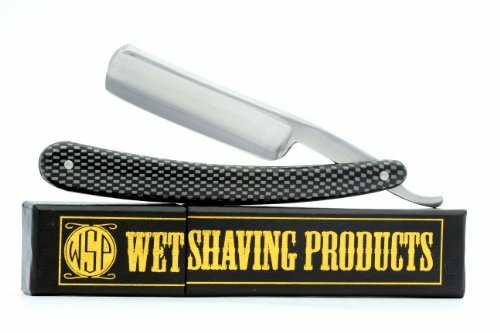 *One of the most important components of successful straight razor use is learning how to properly maintain your razor. Here’s a few simple tips: Use only for shaving beard hair. Gentle stropping of the blade whenever needed. Blade and handle have to be cleaned and dried carefully after use. For long term storage, the blade should be lightly oiled, and the open straight razor be kept in a dry environment. Inside your free WSP travel/storage box is your ticket to self sufficiency and manliness. America’s greatest generation used straight razors. You can experience the closeness, the daring, and the satisfaction of using a real razor. The 6/8″ blade is easy to maneuver & see. The bottom jimps gives you a good grip. This one may not win any beauty awards, but at less than 1/5 the price for the same quality shave as a Dovo, it cannot be beat. And, if you really don’t like it, we’ll take it back. High quality hardened carbon steel blade takes a keen edge. 3″ x 6/8″ blade is easy to judge angles, strop, & hone. Best value practice razor. Knife sharp from the factory, but NOT shave ready (see ASIN B0086GT35I).